Happy Wednesday, everyone! I hope you are having a great week. We are now halfway through Hunger Action Month (! 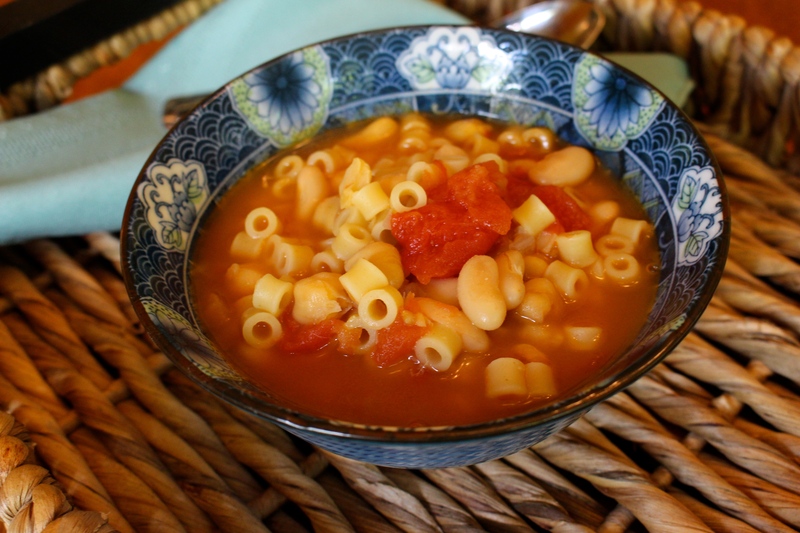 ), which means that I want to share my absolute favorite recipe that I developed for my local food pantry – Bean and Pasta Soup. This soup was my lunchtime staple during my study abroad in Italy because it was delicious and nutritious (and cheap!). Re-creating it for the food pantry brought me back to those simpler times and the Italians’ food philosophy that everyone should have access to good, healthy food (no matter what their socio-economic status was). This soup is chock full of beans, pasta, and tomato, which makes it a perfect, hearty meal for a chilly fall day. Plus, it utilizes pantry staples that are cheap, easy to purchase, and available all year round. 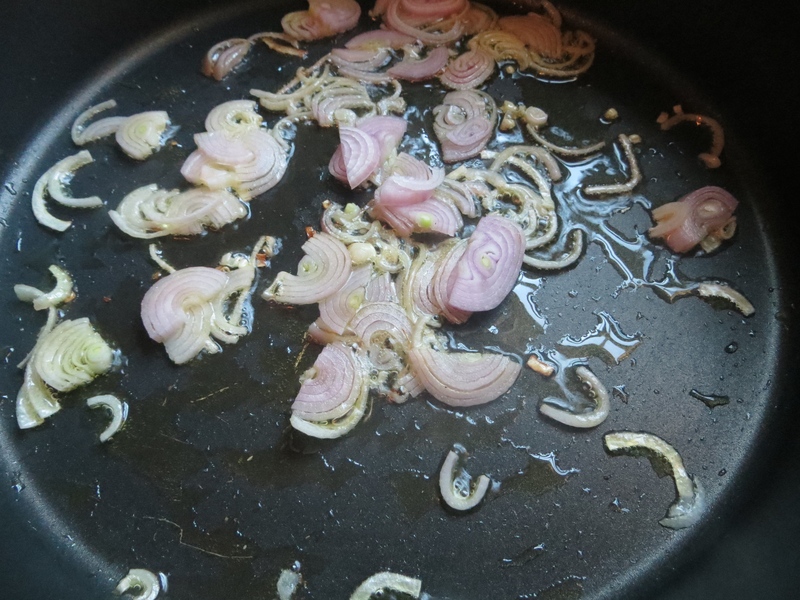 … when the oil heats up, I tossed in some diced onion and let it cook until it became soft and translucent. When the onion was all cooked, I added in a can of whole tomatoes (juice and all!) that I broke into pieces with my wooden spoon. You can totally cut the tomatoes in the can with a pair of kitchen shears (like my mom) or crush the tomatoes into the pot with your hands (like my grandma) if you want an easier tomato “chopping” method. But the side of a wooden spoon works too (if you’re lazy like me!). Then I chucked in a couple cans of drained (and rinsed) beans – cannellini and garbanzo (chickpeas). My soup in Italy only had garbanzo beans, but I like the texture differences between the soft, creamy cannellini beans and the more hearty, firm garbanzo beans. If you like one bean more than the other, feel free to use just one type (the soup will be just as delicious). Now for the liquid. I poured in some low sodium chicken broth and water, cranked up the heat, and brought everything to a boil. When the liquid was at a boil, I tossed in half a box (what was remaining from the Vegetable Soup with Pasta) of ditalini pasta. Any small pasta shape works here, but I just love these little tubes! I hope you enjoy this food pantry-friendly recipe and share it with your family, friends, and community! If you try this recipe or donate its ingredients to your local food pantry, let me know using the hashtag #GSFfightshunger. Because together, we can end hunger. Add in the beans and the canned whole tomatoes (juice and all!). Stir to combine and to break up the tomatoes into smaller chunks. Serve immediately or let cool completely and refrigerate for 2-3 days or freeze for 1-2 months. Recipe from Confessions of A Grad School Foodie – confessionsofagradschoolfoodie.com for Hunger Action Month 2015. Happy Tuesday, everyone! How was your Labor Day Weekend? Did you enjoy the last bit of summertime and sunshine? Good, I’m so glad you did! Today, one week into Hunger Action Month, I would like to share my first food pantry-friendly recipe with all of you! This recipe was developed when the director of my local food pantry asked me to find a way to use up canned vegetables, which the clients get an unlimited supply of (yay!). But after a while, eating sides of different vegetables can get boring. But do you know what’s not boring? Vegetable soup! What I love about vegetable soup is that you can change up the vegetables you put in it to fit your personal preferences. Don’t like carrots? Leave them out! Like garbanzo beans better than pinto? Switch it up! Want to use chicken broth instead of vegetable broth? Go for it! Versatility is a good thing. This easy Vegetable Soup with Pasta starts with a large pot set over a medium heat. 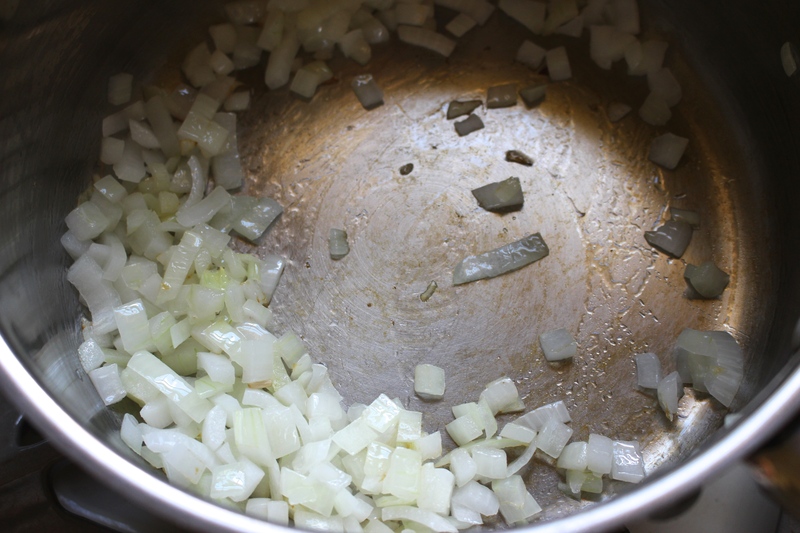 Add in some vegetable oil and a small chopped onion and cook until the onion begins to soften. When the onion is soft, pour in a 32oz carton of low sodium vegetable broth and 1-2 cups of water, depending on how you like your soup consistency. One cup of water creates more of a stew-like consistency, while the two cups of water creates a more traditional soup consistency. Bring the liquid to a boil over medium-high heat. When the liquid is at a boil, it’s time to add the pasta. I chose to use the little tube pasta, or ditalini, but any small pasta shape works here! Carefully dump 8oz of the pasta into the boiling liquid (half a regular box) and cook the pasta according to the package directions. When the pasta cooking time is half over, it’s time to add in the vegetables. I chose to use carrots (for something bright), green beans (for something green), and pinto beans (for protein). To add in some additional color and provide a boost of flavor, I also added in one can of diced Italian tomatoes – diced tomatoes with garlic and oregano. An extra vegetable that makes the soup extra delicious. Now you just need to stir everything together and let the pasta finish cooking and the vegetables heat through. I hope that you enjoy and share this recipe with your family, friends, neighbors, and community. Check out the bottom for the handy dandy printable that can be shared with your local food pantry. If you try this recipe, or donate this recipe’s ingredients to your local food pantry, let me know on Instagram by using the hashtag #GSFfightshunger. Because together we can end hunger. Add in the stock and about 1-2 cups of water. Bring the liquid to a boil. When the broth is boiling, add in the pasta. Cook according to the package directions. When the pasta cook time is half over, add in the carrots, green beans, pinto beans, and tomatoes (juice and all!). Stir to combine and add in a little bit more water if you feel like the mixture is too thick for your liking. Continue to cook until the pasta is finished cooking. We are now five days into Hunger Action Month and it has really made me think about all the different ways we can reach out and fight hunger in our communities. Food pantries are one way that communities can support our neighbors in need, but it’s another food outreach program that has captured my heart… Meals On Wheels (MOW). Meals On Wheels is a nationwide organization that provides meals to homebound seniors to help them remain independent and stay in the comfort of their own homes for as long as possible. Caring volunteers not only provide a nutritious meal, but also a friendly visit (and conduct a much needed safety check). It is a great organization that is staffed by great people who are passionate about taking care of their neighbors. During graduate school, I was fortunate enough to have the opportunity to volunteer at the local Meals On Wheels program. This program was housed in the basement kitchen of a public housing complex, which allowed them to cook all the food they served their MOW clients. It was my first experience in a restaurant-grade kitchen and my first experience working with massive quantities of food. It was AMAZING. My friends and I were tasked with assembling meal trays for delivery and dividing large batches of salads, desserts, and rolls into single-serve portions (not much cooking) and it really made us focus on our food service and food safety skills. Our reward after a long morning of serving up food was being able try the leftovers on the hot food line. My absolute favorite hot item that they made there was eggplant parmesan. But this was not just any eggplant parmesan… it was eggplant parmesan rounds. What I love about this version of eggplant parm is that it is super simple (and breading-free), allowing the eggplant to really stand out and shine – the way eggplant parm should be (in my opinion). I never got the official recipe, but this recipe is the closest to that eggplant parm I ate during graduate school at Meals On Wheels. 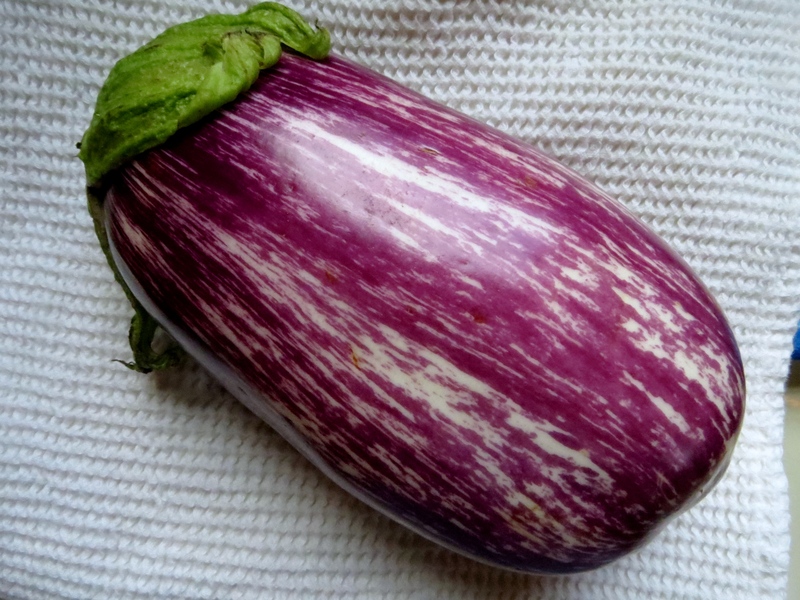 It all starts with an eggplant that’s been sliced in ½ inch slices. Then placed in a colander and salted with some kosher salt – this step seems unnecessary but it really helps the eggplant have a better texture and removes some of the bitterness (yay!). Let the eggplant sit for about fifteen minutes, which is about the time it takes my oven to reach 400 degrees. When the oven reaches temp, thoroughly rinse off the eggplant, pat it dry, and coat it with some olive oil, salt, and pepper. Then place it on a greased cookie sheet. Pop the eggplant into the oven for 20 minutes, flipping the eggplant rounds over halfway through. When 20 minutes is up, pull the eggplant out of the oven. And spoon on a bit of your favorite marinara sauce – this is some really good jarred stuff. Then sprinkle on some part-skim mozzarella cheese. And then the secret ingredient…. … some seasoned bread crumbs. Just a small sprinkle (about ¼ teaspoon per slice) does the trick – it adds a little texture and crunch to the dish. Now, just pop the eggplant back into the oven for 5-6 minutes until the cheese is melted and turning golden brown. It is a memory of a wonderful volunteer experience (and a fitting dish to enjoy during Hunger Action Month). So, kiddos, what have you been up to during the first four days of September? Anything fun? Let me know! Salt eggplant slices with kosher salt and place in a colander that is set in a sink. Let the eggplant sit for about 15 minutes to allow for some of the water and bitterness to leave. Preheat the oven to 400 degrees. Grease a high-sided cookie sheet with non-stick cooking spray. 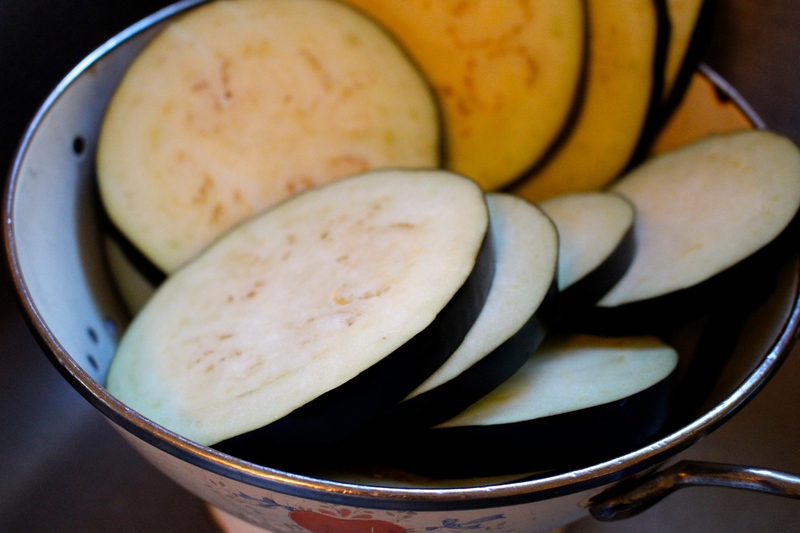 When the oven reaches temperature, rinse the eggplant under cold water, pat dry, and coat both sides with the olive oil, table salt, and black pepper. Place the slices in one even layer on the cookie sheet (if your slices are big in diameter, you may need a second cookie sheet). Pop the eggplant into the oven and bake for 20 minutes, flipping the eggplant slices over once in the middle of cooking. After 20 minutes, remove the eggplant from the oven. Spoon about a tablespoon of marinara sauce on each slice and then sprinkle on about 1 tablespoon of shredded mozzarella per slice. Finally, sprinkle over some seasoned bread crumbs – about ¼ teaspoon per slice. Place the eggplant back into the oven for 5-6 minutes until the cheese is melted and starting to turn golden. To serve: sprinkle on some red pepper flakes and/or dried oregano as desired. One of my fondest food memories as a child is homemade-pizza-for-dinner night. My dad would whip up homemade pizza dough, slather it with sauce and cheese, and bake it until the house smelled like a pizzeria. In my opinion, homemade pizza is a million times better than pizza from a pizzeria… you can control what kind of crust you make, what cheese you use, what type of sauce you use, and what toppings make it onto the finished product… which means that you can cater to your family’s likes, dislikes, and preferences (half vegetarian, quarter caramelized onion, quarter sausage please!). So for my parents’ welcome-home-from-vacation dinner, I decided to combine my two food loves – homemade pizza and pesto sauce – into the ultimate throwback comfort food dinner… Caprese Pizza. If you have been following along on my food blogging journey, you have come to realize that pesto is pretty much one of my favorite things. It’s delicious, the perfect shade of green, and it can be used in a bunch of different ways (on sandwiches, on quesadillas, on pasta, etc.). So I decided to do a play on a traditional caprese sandwich and make a pesto pizza with a fresh tomato topping. And I think it turned out pretty well! It starts with my foolproof pizza dough… I shared this recipe a while back but I’m re-posting some updated photos and the original recipe here (so you don’t have to scroll to find it!). It starts with dumping some flour, some yeast, olive oil, and salt into the bowl of a standmixer. Using the dough hook attachment, mix the flour mixture and add in enough warm water (it should be warm, not hot, or else it will kill the yeast) until a slightly sticky dough forms. Form the dough into a ball, coat in some vegetable oil, and place in the bottom of a bowl. Cover the bowl with some plastic wrap and a clean tea towel and then set the bowl in a warm, quiet place for a couple of hours to rise. A perfect pizza dough ball ready to rise! After the dough has risen, it’s time to make the pizza. Spread the dough onto a greased half-sheet pan and set aside to let it rest until the oven has come to temperature. In place of the traditional sauce (and to mimic the caprese sandwich), dot the crust with the some pesto sauce. This is homemade, but any really, really good jarred pesto can be used. And spread it out into a thin layer. Then layer on some grated mozzarella cheese (the second component of a caprese sandwich). And bake the pizza at 500 degrees for about 10-11 minutes, or until the cheese is melted and bubbly and the bottom of the pizza is golden brown. Let the pizza rest of a couple of minutes (because it’s very hot!). Now all that’s left is to whip up the final (and most important) component of the caprese pizza – the fresh tomato topping. I chopped up a bunch of Roma (or plum) tomatoes (because they don’t have a lot of liquid seed-ness inside) and dressed them up with some olive oil, balsamic vinegar, and salt. Now that we have all the components, it’s time to eat!! My dad cut up big wedges of pizza (just like when we were little!) and then I topped it with the fresh tomato salad. Just like a caprese sandwich… in a homemade pizza form! What a wonderful way to celebrate the two foods that I love the most (and to relive some good childhood memories). Enjoy, kiddos! In the bowl of a stand mixer with the dough hook attachment, dump in the flour, yeast, olive oil, and salt and mix until combined. With the mixer on, slowly pour in warm water (not hot, or else you will kill the yeast and the bread won’t rise) until a slightly sticky dough ball forms. Form the dough into a ball, lightly coat in vegetable oil and place it into a bowl. Cover the bowl with a piece of plastic wrap and cover with a clean tea towel. Set the bowl in a warm, quiet place for 2-3 hours. Pre-heat the oven to 500 degrees. While the oven is pre-heating, turn out the dough onto a greased half-sheet pan (or a cookie sheet with high sides) and stretch it out/spread it out using your fingers. Set the dough aside to rest until the oven reaches temperature. 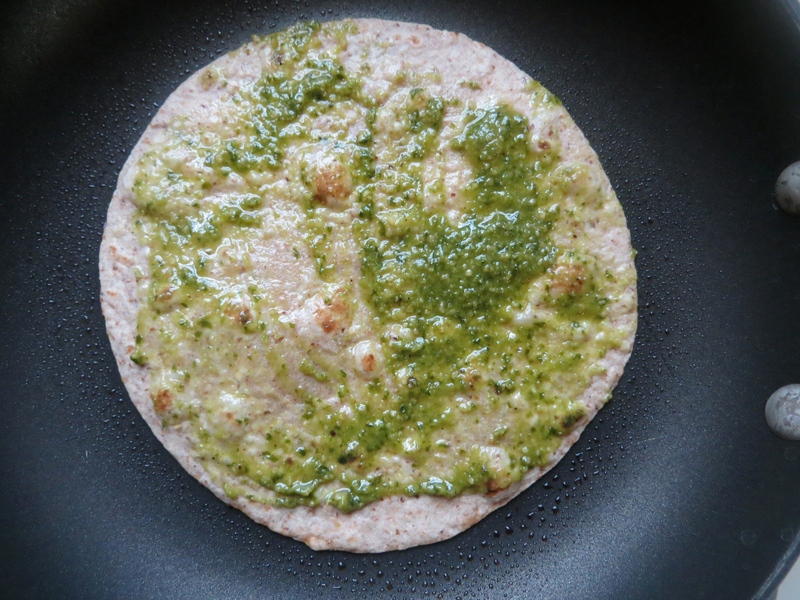 When the oven is pre-heated, spread the pizza dough with the pesto, leaving a 1-inch border on the edges. Cover the pizza with the grated cheese. Bake the pizza for 10-11 minutes or until the cheese is melted and bubbly and the crust is golden brown. Set aside for 1-2 minutes to cool slightly. In a small bowl, combine the tomatoes, olive oil, balsamic vinegar, and salt. Toss to combine. To serve – cut the pizza into wedges and top with some of the tomato mixture. Enjoy! In the bowl of a food processor, throw in the garlic, parmesan cheese, and walnuts. Pulse to combine. Add in the basil and pulse until everything is combined. With the food processor on, slowly pour in the olive oil until a thick sauce forms. Taste and add in salt and pepper to taste. Pesto sauce can be stored in the fridge for about a week or frozen for 2-3 months. Sometimes as I gaze into my huge (sometimes cluttered) fridge looking for something to eat, I ask myself questions to jump-start my brain to help me figure out what I am going to make to feed my constantly rumbling tummy (anyone else suffer from Stomachus Rumblingous Constantous? Okay, good!). So that is how I came about making this Thai Cabbage Salad over the weekend! Thai Cabbage Salad starts with… cabbage. I found this beautiful red cabbage at the farmer’s market and had to buy it, but green cabbage or a mix of both can be used too! It’s all about your preferences – but if you think that both colors of cabbage taste the same (like me), I would suggest buying the red cabbage… it adds a big oomph of color in the final product. Also note that I cut the cabbage into big strips, which make this more like a “salad”. If you want to shred your cabbage, it’ll be more like a “slaw” (which isn’t a bad thing at all!). On top of the cabbage, I piled lots of other veggies in different colors and textures. Crunchy carrots cut into match sticks (if you are going the “shred” route with the cabbage, I suggest you shred the carrots too! ), yellow bell pepper sliced into thin strips, finely chopped cucumber half-moons, and some thawed shelled edamame (fresh soybeans – probably my favorite addition). The edamame provide a good amount of protein (a half cup of edamame provides 8gm of protein! ), so this is a great dish for vegetarians and vegans. Then all that’s left is to add in the delicious peanut dressing. If you have a mini-food processor or a good blender, it comes together in a minute. Peanut butter, soy sauce, ginger, rice wine vinegar, honey, lime juice, and siracha come together and provide a deliciously light dressing that enhances the flavor of the veggies. Yummy! All that’s left is to toss it together. And serve it alongside your favorite grilled meats (like this Thai-marinated grilled chicken). I hope you enjoy this easy salad, kiddos! 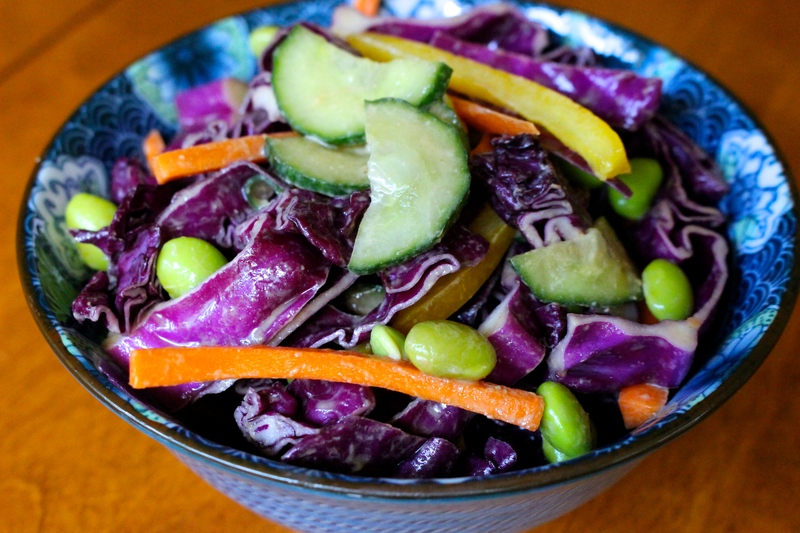 In a large bowl, combine the cabbage, carrots, bell pepper, cucumber, and edamame. In a mini-food processor or in a strong blender, combine all the dressing ingredients except for the water. Blend to combine. Add in the water (between 1-2 tablespoons) to reach the consistency you want (I like my dressing a little on the thin side, but you can make it as thick as you want!). Pour half of the dressing over the veggies and toss to combine. Add more dressing if the salad seems too dry. Serve immediately with your summertime grilled favorites – Enjoy! Note: You can double the dressing recipe and reduce the amount of water you use if you like a thicker “coleslaw-style” dressing coating on your salad. But every once in a while, the sandwich can stump you. Does the bread need to be toasted? Pickles, lettuce, and tomato, or none at all? Italian meats, roasted veggies, or both? Sometimes the endless possibilities end up being too overwhelming and you end up making yourself a PB&J and calling it a day. So, as I stood in front of my fridge a few days ago, I seemed like I was destined to be making the old childhood standby for lunch. Until my eyes fell on the container of homemade white bean hummus, the tub of leftover grilled eggplant, a head of romaine lettuce, and the pint of grape tomatoes… and the H.E.L.T. was born! H.E.L.T. (Hummus, Eggplant, Lettuce, and Tomato) sandwiches are my play on the traditional B.L.T. – while hummus and eggplant are not a true replacement for bacon, it is a great vegan alternative that hits similar (smoky) flavor notes. I was lazy and toasted it in a frying pan, but a toaster works too! When the bread is golden brown on both sides, I removed it from the skillet and set it aside. I then heated up the grilled eggplant. I didn’t want to put any more color on the surface, but just wanted to heat it through and make the outside crisp again. 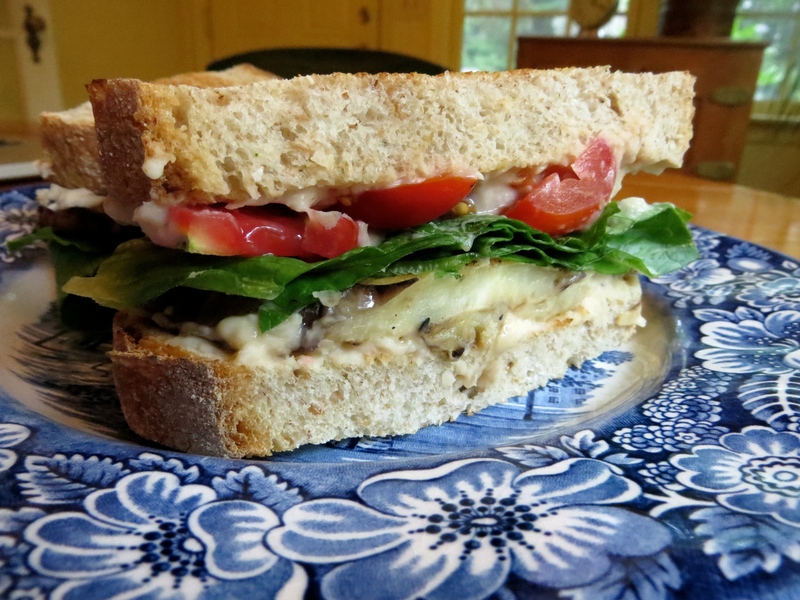 The grilled eggplant is nice and smoky, which simulates the smokiness of the bacon in the original sandwich… plus, swapping the eggplant for the bacon saves you 70 calories (yay!). Then I gathered the hummus, tomatoes, and lettuce and we were ready to build the H.E.L.T.s! I spread about a tablespoon of hummus on each slice of bread. Then I laid two slices of grilled eggplant on one side of the sandwich. And the sliced grape tomatoes on the other side. You can totally use a couple of big slices of tomato instead, but I actually like the grape tomatoes – you get one piece of tomato per bite (and the sandwich doesn’t slide apart!). Then place on a big piece (or two) of romaine lettuce. All that’s left is to pop one side of the sandwich on the other and slice in half. Yum! I love all the layers, textures, and colors of this sandwich – bright, smoky, sweet, crunchy, and smooth. A delicious alternative to the traditional B.L.T.! So, guys, what’s your favorite sandwich? 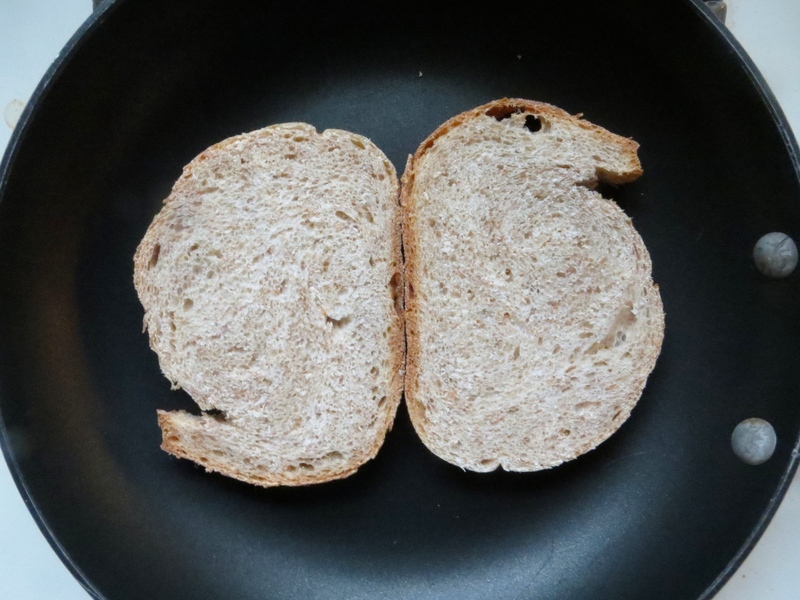 Toast the bread until golden brown on both sides. Place the toasted bread on a board and spread one side of each slice with the hummus (1 to 1½ tablespoons of hummus each). On one slice of bread, place on the grilled eggplant slices. On the other slice, place on the tomato slices and then the lettuce. Place one slice of bread on the other and cut the sandwich diagonally. 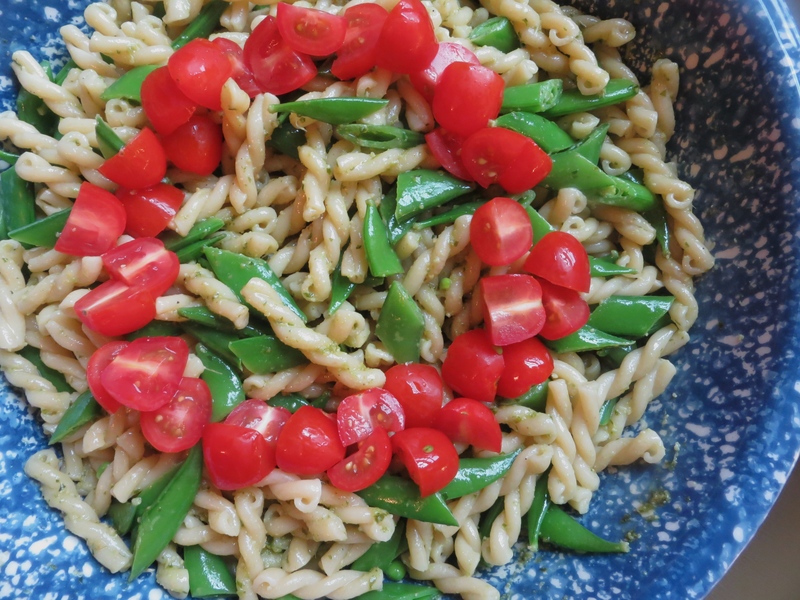 Another summer day, another summer pasta salad… with pesto. Yes, I know that this is another variation on pasta tossed with pesto on this website, but trust me – this is totally different! Promise. What I like about this pasta salad is that it has wilted spinach in it. Pesto and spinach are a great flavor combo (trust me! ), which makes this a yummy summer dinner option (and you get the added benefit of sneaking some good nutrition into your family!). Grab yourself a tall-sided skillet and set it over medium heat. And sauté some shallots in olive oil. If you like some spice in your food, add in some crushed red pepper flakes. When the shallots are all soft and translucent, dump in some washed baby spinach. I love baby spinach in pasta recipes because it wilts down fast and it doesn’t have as strong a flavor as regular spinach (in my opinion). And despite it being “baby” spinach, it’s still a great source of fiber, iron, folate, and vitamin A! Sauté the spinach until it just wilts (the hot pasta will completely wilt it). Set the pan aside until the pasta is finished cooking. Another veggie that tastes great with pesto is peas! I put frozen sweet peas in a colander and pour the pasta over it – peas get defrosted ASAP and everything is ready to be tossed with the spinach. Dinner’s in one skillet! One pot meals, man… they’re a lifesaver! So no fresh pesto until I figure out how to revive my poor plant (or hit up the farmer’s market this weekend). Back to the pasta salad. I threw in some fresh mozzarella. Mixed everything together and garnished with some basil leaves that have been cut into ribbons (or chiffonade) and some toasted pine nuts. Simple, delicious, and easy to whip up on a hot summer night. What are your favorite summer pasta salad dishes (do you love pesto as much as I do)? Bring a large pot of water to a boil. Salt heavily and add in pasta; cook according to the package directions. In a high-sided skillet, heat olive oil over medium heat. Add in the shallots and cook until they become soft and translucent, about 1-2 minutes; add in the red pepper flake (optional). Add spinach to the pan, tossing to coat in the olive oil and shallots – cook for 1-2 minutes until slightly wilted. Sprinkle with salt and pepper and toss to combine. Set aside. Place peas in a colander. When pasta is cooked, pour the pasta into the colander with the peas. Shake colander to remove as much water from the pasta and peas as possible. Pour pasta and peas into the skillet with the spinach. Add in pesto and fresh mozzarella cheese – stir to combine. Sprinkle pine nuts and basil over the pasta for garnish.